Let’s take our relationship to the next level. Fosway’s new Corporate Connect programme gives you a ‘critical friend’ to provide independent, expert support and advice to you in your Next Gen HR, talent and learning decisions. What have you got planned this coming year? Digital or HR transformation? Tackling your employee experience and engagement? Reinventing your key strategies and adopting Next Gen HR or Learning? New projects for recruiting, talent management or performance? Or rationalisation and review of your existing providers? Whatever your strategy for HR, talent and learning in 2018, as Europe’s #1 HR analyst, we can help you de-risk your decision-making you accelerate your thinking and strategy. Fosway’s unrivalled industry knowledge and independent research has always been an integral part of the decision-making process for our corporate clients. We are proud to act as a critical friend to so many HR and learning leaders as they navigate their way through these and countless other challenges. Through Fosway Corporate Connect, we can now extend this flexible approach and value to many more organisations at different levels in the business – whether it is just for you as an HR, talent or learning leader, or for your broader team or organisational initiative. WHAT IS FOSWAY CORPORATE CONNECT? 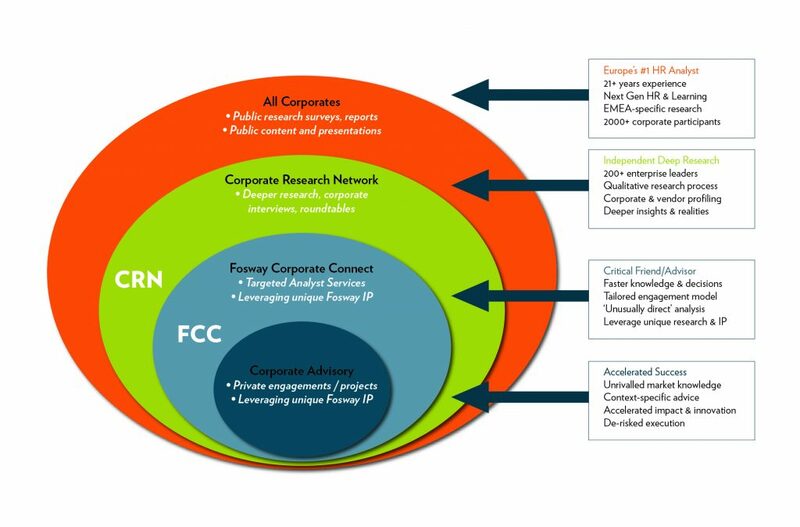 The aim of Fosway Corporate Connect is to provide corporate clients with a dedicated Fosway analyst to accelerate and de-risk decisions via independent targeted input leveraging Fosway’s unique deep European market research, corporate network and vendor insights. Fosway Corporate Connect offers a flexible approach with multiple levels to fit an organisation’s specific goals and operating approach. It is based on a tiered model with a variety of ways to engage with us, including credits to access our analyst services throughout the year based on your specific requirements. These credits can be used at any time and further credits can be purchased during this period if required. Fosway Corporate Connect is more than just a research tool; it is an active engagement model designed to build in-depth relationships and to optimise how Fosway can help support you in key decisions. Fosway Corporate Connect lets you ask us your questions, share your challenges and get the right advice precisely when you need it. We know that crystal balls don’t exist and it’s sometimes hard to know what projects may or may not be happening in your organisation, so the range of services available lets you build your own unique programme that caters to the changing demands of your organisation over time. Members of our Corporate Research Network already benefit from Fosway research and other resources. Fosway Corporate Connect takes our engagement with you and your organisation to another level. It enables you to accelerate and de-risk decisions through a whole range of benefits. If you want to stay ahead of the game, reduce risk and spend precious budgets effectively, Fosway Corporate Connect can be with every step of the way – your trusted advisor with answers and insight where and when you need it most. Download more detail about Fosway Corporate Connect here.